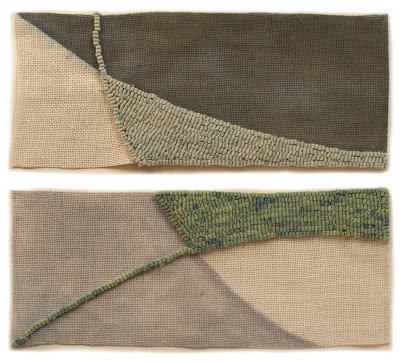 2013 #18, hand dyed wool and egg tempera on linen; 2 panels, each 7 x 16 1/2 in. It's been at least a couple of years since I stopped listening to the radio and had complete quiet in the house, and I believe it's been very helpful to me in coming up with ideas for my work. Instead of my head being full of politics or social issues, my mind is free to wander, thinking of this and that, having little brain waves, using my "little gray cells" as Hercules Poirot would put it, or "using my noodle" as my father would say. I had taken out a sheet of thumbnail sketches for new hooked drawings, and began to think about where I would take the next works. One day I just looked down at a sketch and thought, gee, that could be a diptych! Of course diptychs have been on my mind, having just completed a textile diptych, which you can see here, and not long ago a painting diptych here. I like the way forms leap across the space between panels, the way our mind completes the curves, makes them whole, yet at the same time creates a jumping rhythm. 2013 #19, hand dyed wool on linen; 2 panels, 12 3/4 x 8 and 8 x 8 in. The theme of both these pieces are curves, how they continue across a divided space, the relationships set up from one panel to the next. I like the big simple sweeps of color, wool, and linen; I enjoyed playing with vertical and horizontal formats. I think I'll do more of these. Such subtle colors in the bottom pair. We don't do much radio and usually only public TV, so nothing too stressful there as we don't watch the news shows. We get the NYTimes M-F and are pretty much just reading the Arts, Home, etc. and ignoring the news. So much bad news and so little one can actually do. All my years at the newspaper make this kind of behavior hard to do, but I think it is becoming an issue of physical as well as mental health. And this year any time I was making art it was usually with very little background noise, just now and then a little music. Thanks for your comments, Ms Wis and rappel. I am still vitally interested in news, but get it online, with the NY Times and political blogs. In that way, it's quiet, I read what I want when I want, and have my mind free when I'm working. I love radio silence when I am working out designs, and leave the sounds of the nearby ducks and other birds to provide the background. But I must admit to loving having either BBC Radio 4 on, or Jazz playing when I'm stitching - my mind seems to be able to filter them out when deep thought takes over. I love the lines and the subtle colours of your diptych curves. What beautiful designs you execute. Olga, I do my rug hooking in the evening, while listening/watching tv. Once the design is worked out, the hand work doesn't require much thought, so I find it relaxing to have some "noise" while working, as you do. I'm glad you like the diptychs. Love the grays. So soft and calming, yet the lines give a sense of movement. Perhaps a midnight stroll. I need silence during the design process but love to watch t.v. or pop in a movie while hooking. Thank you, Lori; I don't usually use subdued colors in my textiles, but it's nice for a change. Awesome pattern draw, I very like it. A New Painting: "Curves and Square"
A New Textile: "Lime Green/Black Ground"
A New Boxed Paintings: "Black and White"
A New Painting: "Shadow Ladder"
At the Hood Museum: "Cubism and Its Legacy"